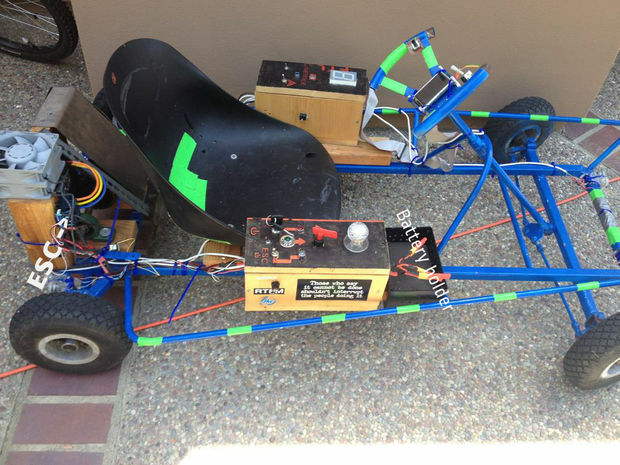 A 15-year-old Maker going by the name of Gizzmotronics has built an astonishing four-wheeled contraption controlled by an Atmel-based Arduino board. The young Maker detailed the build process of this road-worthy device in a recent Instructables post. Though the creation utilizes the frame of a gas-powered go-kart, our Maker installed an electronic motor for this project. Upon removing its existing gas engine, Gizzmotronics selected a Hobbywing Xerun 150A brushless electronic speed controller and Savox BSM5065 450Kv motor to control his new whip, which can achieve a top speed of around 30 MPH. 3 LiPo batteries that regularly supply 19-20V power the device. Zipping around at a moderate 15 MPH will yield about 30 minutes of driving before needing to be recharged, Hackaday‘s Rich Bremer reveals. Aside from throttle control, the Arduino is responsible for other operational aspects of the makeshift vehicle such as controlling the LED lights that serve as headlights, tail lights, turn signals, brake lights and even backup light. There is also an LCD display mounted to the center of the steering wheel, which too is powered by the Arduino and displays the throttle value, status of the lights and the voltage of the battery. There is a potentiometer mounted to the steering wheel for controlling the go-kart’s speed; the value of the potentiometer is read by the Arduino board, which in turn sends the appropriate PWM signal to the ESC. The headlights have 3 brightnesses, each controlled via PWM signal provided by the microcontroller. To assure against any false starts, the Maker has installed a personal security measure. “The throttle is only functional while the right joystick (2-axis) is held down, as a safety measure,” he noted. 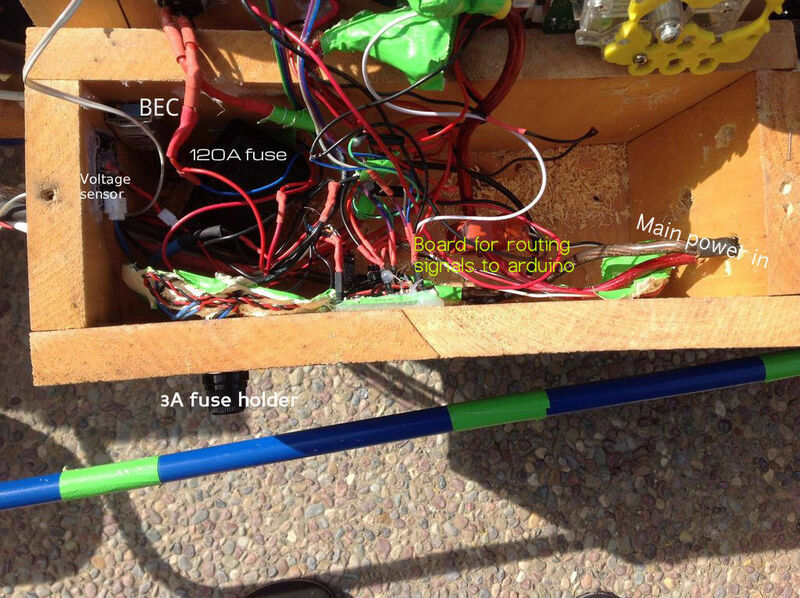 If you want to learn more about Gizzmotronics’ creation, the full Instructables post can be found here. To find more Arduino-powered, you can always browse our archives here at Bits & Pieces. 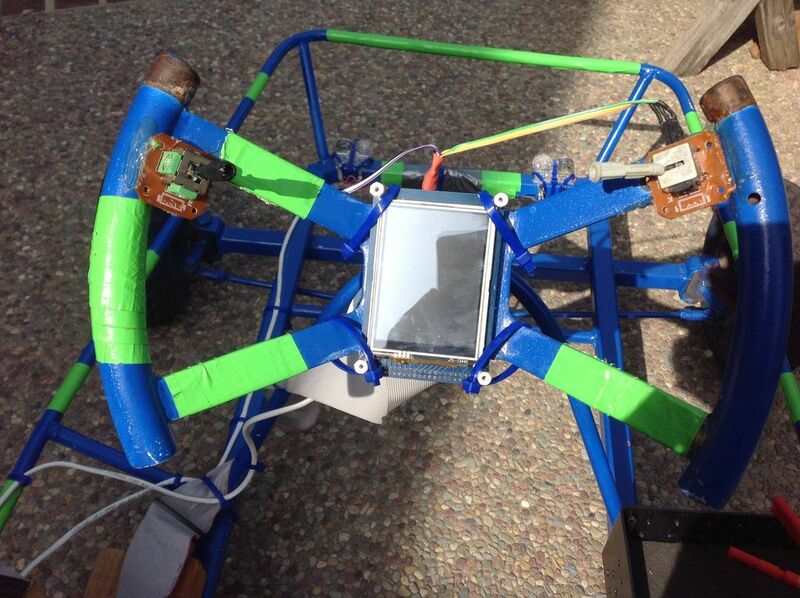 This entry was posted in Arduino, Maker Movement, Young Makers and tagged Arduino, DIY, Electric Go-Kart, HackADay, Instructables, Maker Movement, Makers on July 28, 2014 by The Atmel Team.